Region: Throughout the United States and southern Canada. Life cycle: One generation produced per year and the larvae overwinters in the soil. Physical Description: The adult is pale brown, oval beetle that is about 1/5 inch in length and is marked by rows of punctures. The larva is plump and white and the eggs are laid at the base of plants. 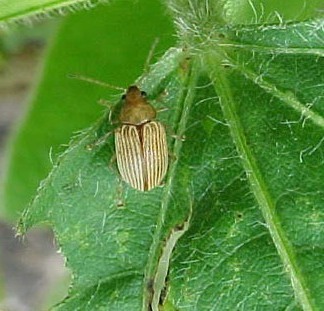 Feeding characteristics: The signs of this beetle are long curved or zigzag feeding marks on leaves, but usually do not seriously damage the plant. The larva will burrow into large roots and chew on the smaller ones. They can also destroy germinating seed. Controls: Spading or plowing in the fall, instead of spring, will help control by destroying the larvae.